Looking to landscape your yard? Have you considered hardscaping? Unlike a softscape of grass and plants, a hardscape is one that features materials such as stone, concrete, walls, fencing, and even water features. If you like the look of these details, check out these 5 benefits of hardscaping your yard. Many homeowners enjoy relaxing in the great outdoors, especially from the comfort of their own backyard! Whether you have a tiny yard or a whole acre, a hardscape can beautifully extend your living space into nature. 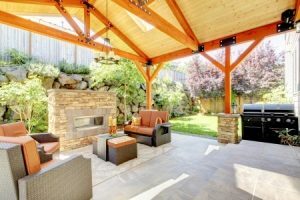 Popular choices includes flagstone patios, outdoor kitchens, pergolas, retaining walls, and custom fire pits. The options are endless! While beautiful landscaping offers curb appeal to any home, those roses can die and soil erode. A hardscape offers a permanent, stunning appeal to any home, and it can instantly increase the value of your home. If you decide to sell, an attractive, hardscaped yard is a great bonus for prospective buyers. Sick and tired of mowing the lawn? Can’t keep track of water restrictions in the summer? There’s no need to worry when you have a hardscaped yard! Ditch the brown, patchy grass for a stone patio or deck, and replace sickly flower beds with river rock or native plants for an ultra low maintenance yard. Whether your neighbors are 10 feet away or 100 feet away, you may enjoy some privacy when lounging outdoors. A creative hardscape can provide instant privacy and beauty. Rather than planting large hedges or trees that require frequent maintenance, a fence, wall, gazebo, or rock feature can help your yard feel more like a secluded oasis. Tired of dealing with an uneven yard riddled with erosion? Stone steps, a retaining wall, or multi-level deck can solve all your problems! With proper installation from a reputable landscape company, you can enjoy your yard again without worry. Interested in the benefits of hardscaping your yard? Call MDM Landscapes at 817-396-0125 for expert hardscaping in Granbury, TX and Aledo, TX! Posted in Uncategorized on January 3, 2017 at 5:40 pm by MDM Landscapes.